Winner will be posted on Tuesday, September 13th! 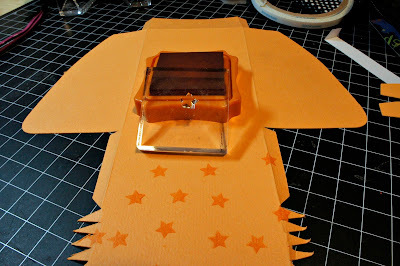 If you are visiting from Karlee's Blog (I love Karlee) of you are on the right track.....if you are just visiting my Blog you are in for a treat because it is Blog Hop night at My Pink Stamper. I am the last one on the list so make sure if you missed anything to go HERE to start at the beginning. There is also the Blog Hop list below. I know that is where my family focus has been the last few weeks so I think it is totally appropriate that we have a Back to School theme for our Blog Hop. 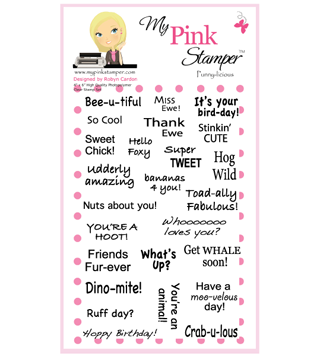 Our assignment this month was to use Robyn's (My Pink Stamper) new School Days stamp set. What a fun set this is. You can find out how you can order one of your own HERE. We also gave the Design Team a little twist. It has to be a 3-D Project and use your Cricut in some way. After you see all the incredibly talented My Pink Design Team projects please make sure you go back to My Pink Stamper and play along with us by making a project of your own. 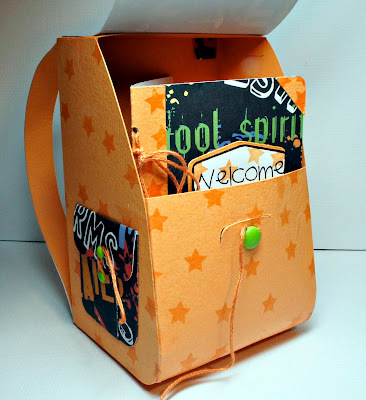 I used the Campin' Critters Cricut Cartridge and made the Backpack and a little notebook to go inside. My idea is that my daughter can put all the mini photos of her friends from their school pictures that they already had taken on the second day of school. I left off the sleeping bag from the backpack. I used my Gypsy but if you don't have one you can just use Fit To Page if you are using an Expression to get the same size I did. After I cut the base, I used the star stamp that is on the School Days set to make my own background. I have to tell you that about the only thing I hate about my Cricut is the little tick marks that it makes when you need to fold something, so I am very thankful for my Gypsy because I can take them out. But....sometimes it makes folding a little difficult as in the example of the pockets on the sides of the backpack. Here is a little tip I use when doing something like this. I cut the piece out with the tick marks on scrap paper. Then I laid it over the "real" cut and score. That way the where to score is visible on the "real" cut but no tick marks. To make the little notebook, I used the journal on the Campin Critters cartridge hid the tick marks again on the saying and stamped my sentiment. I cut the inside pages of the notebook 3 times and laced them together with the cover with some embroidery floss. 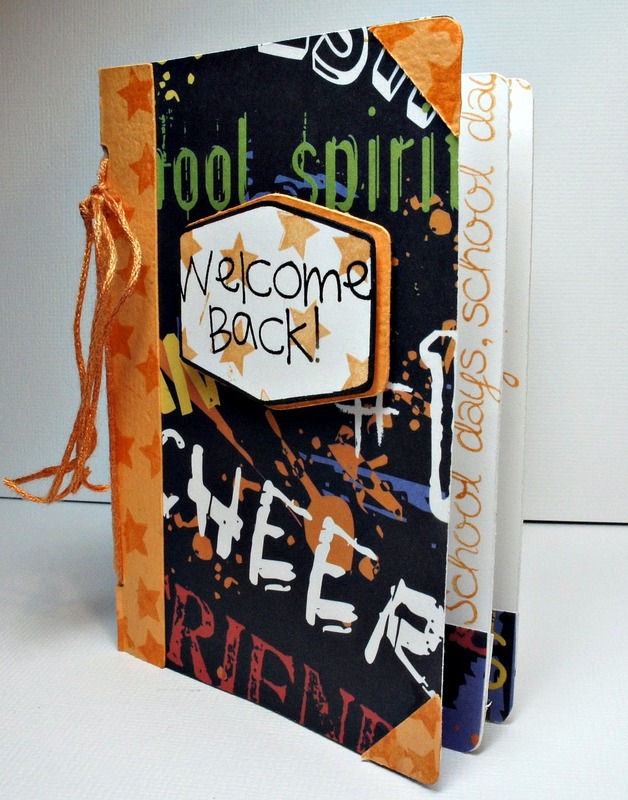 I used scraps from my other cuts to add borders on the pages and then stamped another one of the sentiments from the School Days set on the pages. I added brads at the openings of the pockets and backpack latch. Hard to see, but I LOVE those folds in the little pockets and think I am going to make them on a scrapbook page BIG!!! I will post a winner on the given date, readers will have to check back to see if they have won and contact me with their information. I no longer contact or "track" down the winner. I never ask anything of anyone to win on my Blog (except for some stupid questions sometimes, LOL) but I feel that if you aren't a reader of my Blog and are just visiting to win a prize it isn't really fair of the people that do read all the time. Want to see what you can win this time?? All you have to do is leave a comment, hopefully pertaining to my project, by 10:00 PM Central Time on Sunday, September 11th and I will pick a winner with Random.org--please remember to check back to see if you are the winner. I will be posting the winner on Tuesday, September 13th. Here is the Blog Hop order in case you missed it.......I am the last one on the list, so now it is time for you to go back to My Pink Stamper and play along in the challenge with us. Campin' Critters = Backpack @ 10.88" on the Gypsy & Notebook @ 4.0"
WOW A twofer two projects and one stop lov ethese those colors are so bright after the hop I'm coming back to check this out a bit closer awesom job!!!!! This backpack is incredible. I love it. Thanks for the chance to win. This is terrific Maria, I love the school spirit theme you went with! Your project is fantastic! Such talent throughout this bloghop! That backpack is so cool. I love orange so the color was awesome. The side pockets are really neat too. Could totally see that in school colors for a cheerleading group. Great idea! I'll be back!! I love the backpack and the notebook that is inside of it! Such a cute idea! Love your backpack with the matching notebook! Omg Maria! That is awesome!! What a great creation!!! I love the backpack. Now I will have to add Campin Critters to my list of must have cartridges. Thanks for the giveaway too. This is a really fun idea!!! 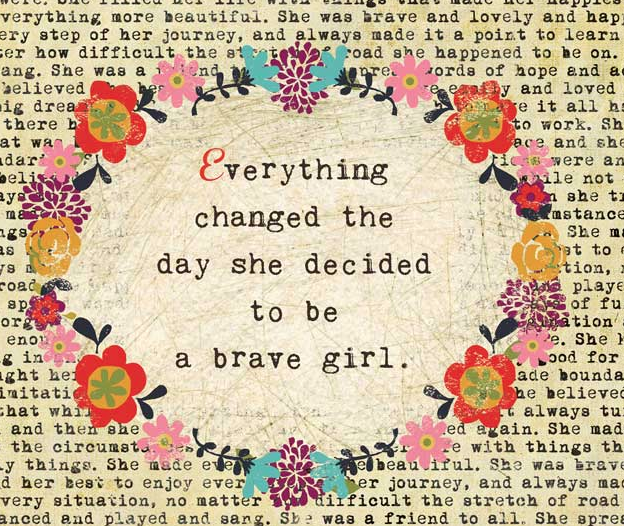 Will keep it in mind when my girls get older!! Great project Maria!! Thanks for sharing and for the chance to win a set of Robyn's famous stamps!!!! Enjoy your weekend! I absolutely love this! It couldn't be any cuter! Thanks for sharing! What a great project! Did it take you forever to make? Thanks for sharing! What a cute idea, I love that you made your own background on the paper. TFS. That is a cute creation! The detail is wonderful and very apprecited! 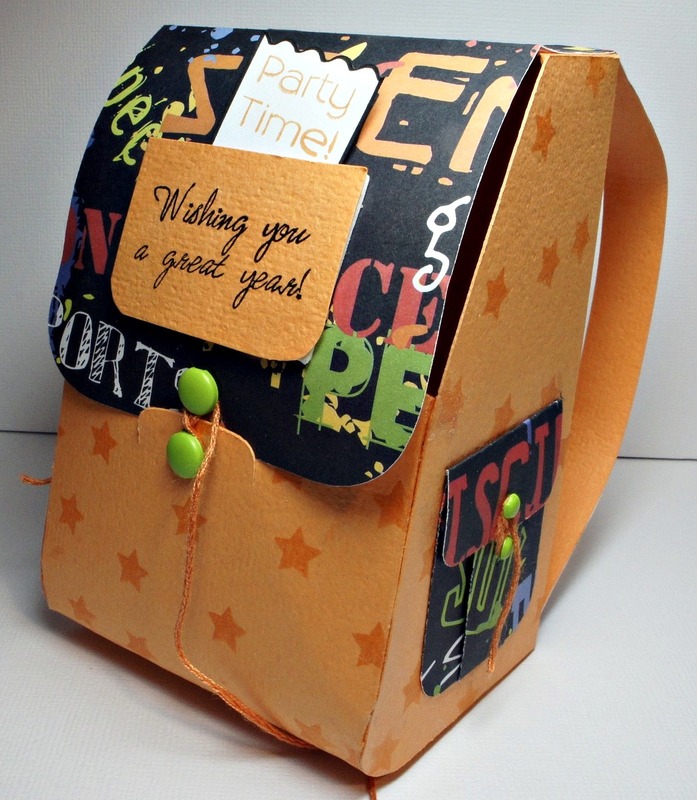 Thanks for ending this AMAZING blog hop full of ideas and creativity with a bang! What a great project! I love that the notebook fits inside the backpack! Just hopping along saying Hi to my fellow DT members. Great work! Have a fabulous weekend! This is awesome! That bookbag is amazing, I love how big it is and how you figured out all of the folding! So much fun! That is a really cute backpack. I was wondering how to make one - thanks for all the info. Thinkin' I'm gonna have to get Campin Critters now!! The backpack is so cool....TFS!! That is a super cute backpack!!! Your backpack is so Cool! I am your newest follower and I hope you would stop by my blog and follow me as well! Thank you for the chance to win!! 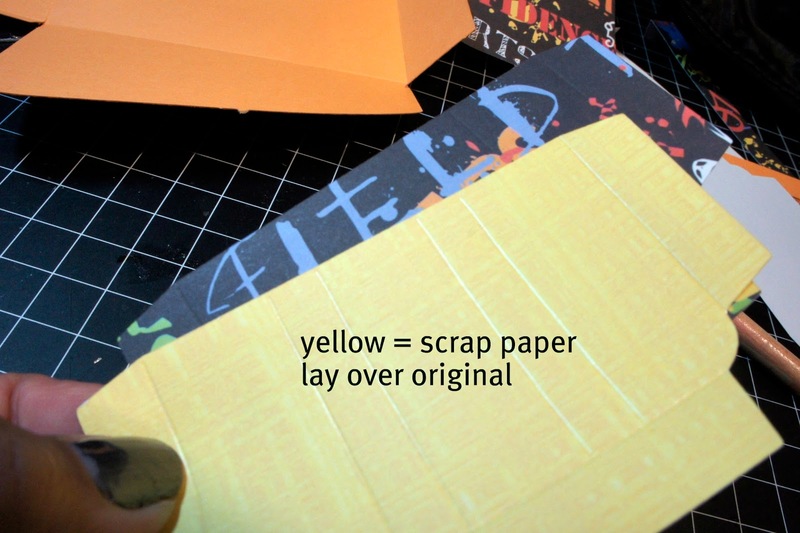 I would have never guess that you MADE the orange patterned paper. Great work. Nice project....Thank you for sharing. I will definitely have to get this cartridge now! So adorable, and I just love the colors! Thanks for adding the giveaway. I will definitely be back, I love your ideas, very inspiring! Super backpack! Love the little notebook for the inside! I love your project, I need to do more things like that for my kids. Thanks for the inspiration! Maria, as always you come up with creative projects and this one is no exception. Great job! Wow! Love all the colors. Love all the details in the photos, too! Super cute project! I love how the notebook fits right inside. What an awesome idea! The project is totally cute, but the idea of your daughter having a little book for all those shared school photos is brilliant!!! WOW! Great use of that cut - and definately a LOT of work you put into this! Thanks for sharing!!! Great project! I love the notebook. Everyone's 3-D projects were amazing. They just kept getting better and better. What a great project. Thank you for being so detailed and offering your tips too! OMG! 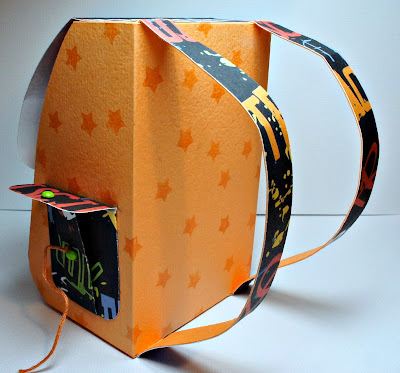 your project is simply adorable!Thank you for the inspirtaion!I am off to make a few of these for both my boys teachers but make it X-mas theamed, fill it full of classroom kids pictures and give it to them as a gift! What a terrific way to end this hop! I'm truly hopped up now and off to crafteven though it is after 11pm! That backpack is too cute!!! 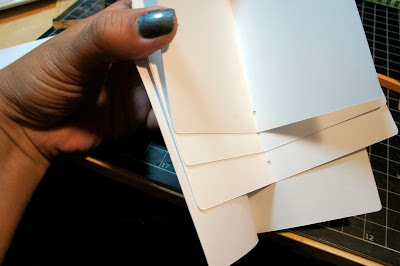 What a great idea for the little notebook/photo album. how funny, my kids will say stuff about my projects that i don't "see". LOL I love orange for everyday, such a happy color. Just love this pack, great job and the littel book for inside. Awesome! Love how the backpack is a holder for the mini book. So... how does it feel to be so ridiculously talented!!!???!!! LOVING this project my friend! It's fab! Don't enter me in the prize because I am SOOOO lucky to get to ALREADY own this super cute set!!! SO proud to be a My Pink Designer with you! Another great backpack. Yes, I agree with you on the Gypsy. I love I can hide what I don't want the cricut to cut! Thanks for sharing the fun project you made. First, I had no idea there was a 3D backpack on Campin' Critters! Thanks for enlightening me on that one! Second, I totally agree with you about the tick marks and thanks for the advice about taking them out and how to figure out how to score without them - I hate the little bump they make on the fold line! Third, I just love this project! This is such a cool little backpack and I love all the goodies you were able to stuff into it!!! Thanks so much for sharing and of course I'll follow your blog! Looking forward to your next creation! Now this is something my granddaughters would REALLY love! I don't have Campin' Critters -- so Z will go searching for it today! Thanks for this super cute idea to use school photos in a creative way (and get the little ones organized)!!! This is such a cute project and I like the colors! And now...another cartridge to put on my wish list! I have been following your blog forever and I love it. You always inspire new ideas in my papercrafting! Thank you! Love the backpack and notebook. Great idea to use it for pictures. Thanks for the opportunity. LOVE, LOVE,LOVE tour backpack and journal!!! I love the notebook!! The papers are perfect! That is a great set. Very cute! TFS. I couldn't agree more about the tick marks - a gypsy might be worth the investment just to get rid of them! I love the way you bound the book - I don't have a bind it all yet - and your way is so easy and cute anyone (even me) can do a book! 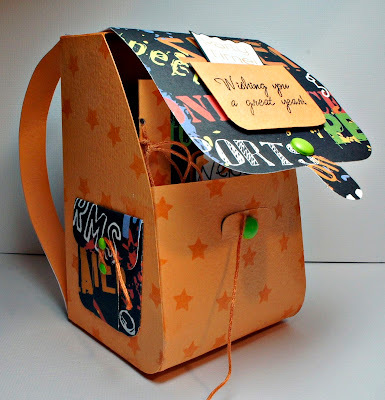 Love the colors you used on this...it's such a fun project! Thank you for the tip about using your gypsy to remove the score lines! very cool projects Thanks for sharing! WOW! Your project is fantastic! This is a fantastic backpack, so many details. I really like your use of the brads for the pocket closure. I'm always inspired by your creativity, Maria! Amazing!!! I love that both of these were made to go together!!! I'M GOING to have to bookmark this page - THIS backpack is a must for a lift... LOVE IT!! love the fallish colors -would love if you came and participated in the FALL colors at http://www.lovetocrop.com - perfect!! I love how you matched the notebook to the backpack. I just made one of those backpacks the other day, I was amazed with it as I am amzed with yours. Great job! What a great idea. This is good for any kid. super cute projects, I love the closure for the backpack. Cute project! It looks like I'm going to need to run out and buy a cartridge with a backpack cut. Thanks for the chance to win. Cute backpack! Thanks for breaking down the steps a little :) The school paper is also very cute! Wow, super cute backpack. Love the pattern/colored paper you chose for it! TFS! What a great project, that cart is on my wish list now!!! I love the backpack it is to cute!! This was my first blog hop and it was so much fun!! Thanks for chance to win!!! How unique! The backpack with the notebook inside! I love it! The blog hop was FUN!!!! Thanks for the opportunity to win! LOVE Robyn's stamps! Great project, love the backpack and matching notebook. Always need paper for notes....Thanks for sharing. I love both projects! The paper you used is so fun. I love the backpack you shared. 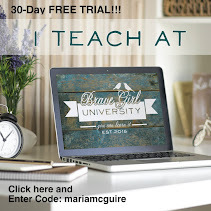 This is the first blog hop I've participated in. What great ideas! Now that is a super cute idea! I like that i'm not the only one who hates those fold marks the cricut leaves!!!!! Great project!!!!! super cool project. i love it. what an amazing and creative project. tfs. What a cool backpack! Loved seeing the steps on how to make it. Thanks so much for sharing and for the chance to win. MPS stamps rock! Love your backpack. Love that you show how to make it. Super cute backpack. 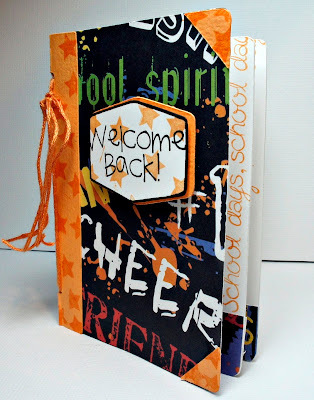 I would love to make something like this for a daughter's spirit squad. That is really cute! I love the notebook! I think the paper is fun and your project is terrific!!! I like your idea of making something to go inside the created backpack. I also like your tip on the tic marcs...SMART! Thank you as always for organizing our events. I appreciate it! Very NICE! I love the matching set that back pack is super cute. 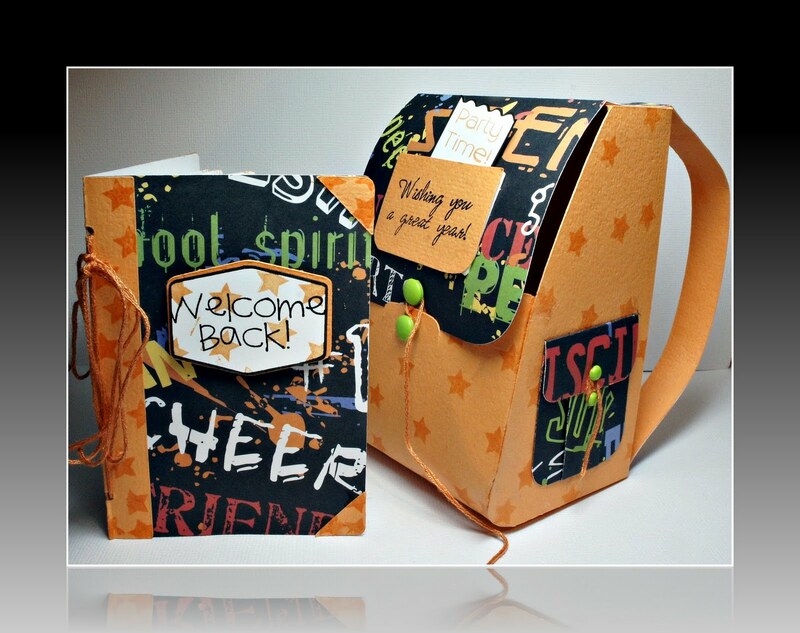 Love that you made little things to put in the backpack. It is so cute.